Martin, G8JNJ, sent me an email with some suggestions for getting the super-regenerative Fredbox receiver to work. He also sent me a link to the blog of Steve, G4AQB, which mentions the Practical Wireless CQ2 receiver design on which the Fredbox receiver is supposed to be based. 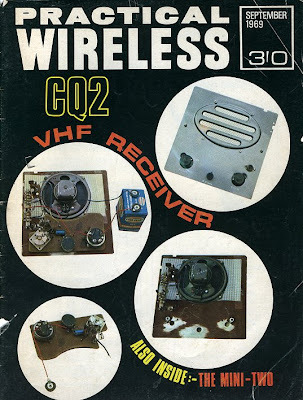 I remember the name "CQ2" and the picture on the magazine front cover and circuit diagram shown on Steve's site look similar to the receiver I built in the early 70s to listen to the 2 metre band which finally gave me the interest to get my Class B (144MHz and up) amateur radio license. I seem to recall that the article also had detailed drawings of how the components in the receiver were to be laid out. Steve writes that he mounted the receiver on an aluminium front panel but that this played havoc with the tuned circuit so he rebuilt it on a piece of plywood! My memory is pretty poor these days but my recollection is that I built it into an aluminium box of the sort that you could readily buy from the local radio parts shop (those were the days when there were local radio parts shops! ), like a box with a lid secured with two self tapping screws. The box stood on its side so the lid was the front panel of the receiver. Steve writes that he built a quad antenna to use with the receiver. My antenna was a dipole mounted on a wooden stand in my bedroom and fed with a few feet of audio co-ax, since at the time I was ignorant of coaxial cable properties like impedance or loss! In those days I lived with my parents in Rayleigh, Essex. I was able to receive the local police on the CQ2 receiver, as well as amateurs in the Southend area such as Barry G8HNX, John G8IDI and Chas G8HVS. I could receive the GB3VHF beacon from Wrotham, Kent, and also a couple of old-timers who had a regular sked: G6LL whom I think was in Hertfordshire and G5OX who may have been in Ashford, Kent (or perhaps it was the other way round.) This was nearly 40 years ago and I'm surprised I can still remember any of it! Steve also writes that the radiation from the super-regenerative receiver wiped out the local TVs. I don't remember that, fortunately, or an end may have been put to my aspirations to be a radio ham before they even started! But my first proper transceiver - a Hudson AM108 ex-taxi radio that I bought for £5 at the RSGB Woburn Rally in 1973 (which was actually before I was licensed) caused patterning on my parents' TV on receive! After I got my license I soon found that it caused serious breakthrough on my father's stereo hi-fi on transmit as well, so my operating was done mobile /M from the car after that. So much fun with such primitive equipment! I often wonder if all the technological advances we have today have really added to the enjoyment of the hobby. One of the things that annoys me about Microsoft is that it has created an operating system that behaves as if it is your job to service its needs rather than a tool that is supposed to serve yours. I'm thinking specifically about updates. Windows constantly nags you to install updates (which wouldn't be necessary if they'd designed the thing properly in the first place) and then it expects you to interrupt what you're doing while it does. After you have downloaded updates it nags you to restart the computer in order to install them. Perhaps they could have designed it so you didn't have to restart the entire OS after every change? When you do shut down it won't let you switch off while it is installing updates, so you have to wait around twiddling your thumbs until it is finished. Hey, Microsoft, it's MY computer, okay? I just received an update to Internet Explorer 8 (which I don't even use) today. After it was downloaded, Windows nagged me twice to restart the system by popping up a window in front of what I was doing, even though I was in the middle of writing something and did not want these interruptions to my train of thought. Just click Start, Run, type the magic words into the box and hit the Enter key. What it does is kill the Windows update service for the remainder of that session. Windows will nag you no longer, and your updates will be installed the next time YOU decide to restart. The success of my project to make an FM version of G3XBM's Fredbox was always going to depend on the receiver. The Fredbox receiver is a simple three transistor super-regenerative design. This is the only practical way to make a receiver small enough to fit in a hand-held case. It is also the only cost-effective way to do it, because making a conventional double-conversion receiver with crystal control just wouldn't be worth it for such a project. 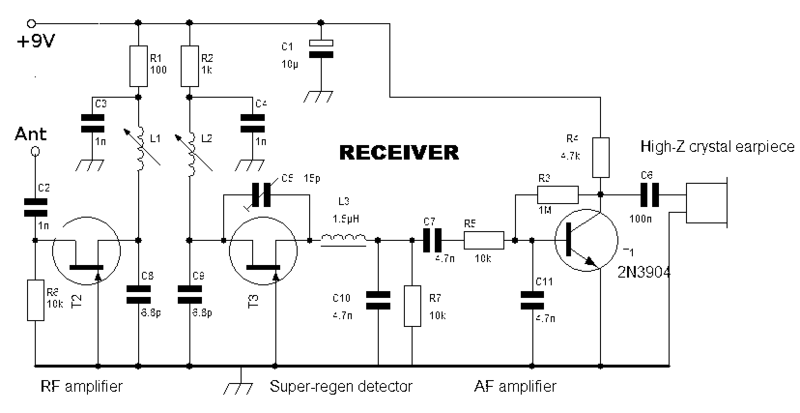 What I didn't know were a) would the super-regenerative receiver work with FM signals (the original Fredbox was designed for AM) and b) would it be sufficiently stable to stay on frequency without the benefit of crystal control? However, what I didn't give too much thought to was the possibility that I wouldn't be able to get it to work at all. Because this is a VHF circuit I didn't think I could try it out on the breadboard so I made it up directly on to Veroboard. The layout is pretty similar to Roger's original layout from what I can tell from the pictures on his website, although I think he made an etched circuit board, something I'm not able to do. I drew up the layout using a bitmap editor. This shows the components from the top view. The large outline components are the Toko S18 inductors, and the red lines are wire links below the board connecting the ground traces. 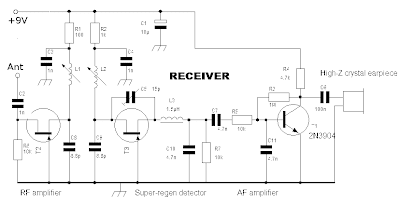 The schematic for the receiver part of the Fredbox is shown below. As with the Nano-40 I used an MPS13 in the audio stage in the hope of getting a bit more audio gain. I applied power and expected to hear a hissing sound in the earpiece which stops when a signal is tuned in. However I heard nothing at all. The audio stage appears to be working, as I can hear a faint buzz if I touch something metal to the input. Alan, VK2ZAY had a lot of trouble getting the receiver to work as well, and he is an experienced constructor who knows what he is doing. I suppose this should have warned me off trying this project. Alan replaced the axial choke for L3 with half a dozen turns of wire on a ferrite bead, and I did the same, but to no avail. I also substituted a variable trimpot for R2 which in many other super-regenerative receiver designs is a variable regeneration control. But no matter what the setting of the pot I could not get any regeneration to occur at all. 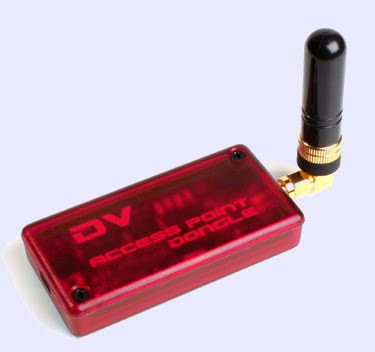 The Digital Voice Access Point (DVAP) Dongle is a small device now available in the US that plugs into a computer and lets you create your own low power (10mW) RF gateway to the D-Star network. Leaving aside my dislike of D-Star (it is incompatible with existing radios and requires you to purchase an Icom radio to participate, which in my book makes it effectively a proprietary system) for a moment, as someone living in an area where you hardly ever hear any 2m FM activity I can see the attraction of something like this. It would allow one to make some internet-linked ham radio contacts from around the house using a hand-held. A couple of years ago I started looking into the idea of setting up a low-powered personal EchoLink node, for similar reasons. I prefer EchoLink to D-Star for the simple reason that almost any existing FM radio can use it (as long as it has a DTMF keypad). EchoLink has been going for years and already has a critical mass of users, which is surely more important from the point of view of finding people to talk to than using some new and more state of the art system? Unfortunately it appeared that in order to set up an EchoLink node I would need to apply for special permission, providing details of three people who could turn the equipment off on instructions from Ofcom, wait months for permission to be granted, etc., etc., which is way too much hassle. I don't think you are exempted from this procedure simply because the RF output power of the node is very low. Because of this restriction doubt if many people in the UK will be using the DVAP Dongle either. As someone who likes a walk in the great outdoors I enjoy reading accounts of people who take their radios out into the countryside for a bit of QRP fun. Today I thought I would try to emulate them. However although I did make a few contacts the attempt was a bit of a disappointment on several counts. Even the photos I took with my camera self-timer were disappointing as the operator completely obscured the radio and a picture of myself sitting on the ground at the foot of a tree apparently talking to my hand is not something I feel should be preserved for posterity on the internet. As the CQ WW WPX SSB contest was on I thought this would be a good opportunity to make some QRP SSB contacts. The batteries in the FT-817ND seemed to be less than fully charged, and the battery endurance of that radio is poor enough already thanks to its power-hungry receiver. I decided to take my K2 instead, which would give me the benefit of 10W output and really punchy audio. So the local dog walkers witnessed the odd sight of someone setting off up the forestry track into the woods near Watch Hill wearing boots and rucksack and carrying a small Pelican case. Fifteen minutes later they would have witnessed the even odder sight of the same person trying to throw a stick with a bit of wire attached over a tree branch. Now I know why the MP-1 was invented! After about ten minutes of persevering I managed to get the wire over a branch about 12ft high. The stick hung down the other side tantalizingly out of reach and I spent the next five minutes trying to hook it with the end of my walking stick so that I could pull the wire taut and secure the end of it. I had previously prepared two lengths of wire for my portable antenna. One is about 22ft long, and has a few feet of nylon cord attached to the end for tying to sticks or rocks to hurl over branches and then secure in position as the radiating element. The other is about 16ft long and is laid out along the ground as a counterpoise. They are fixed to the red and black terminals respectively of a BNC to binding post adapter which is plugged in to one of the antenna sockets of the K2. The reason for the selection of these particular lengths is that I seem to recall them being suggested by Elecraft as good lengths to use with the T1 portable auto-tuner. There are no picnic benches or tables in the forest so I just sat down on the ground and used the Pelican case as a table. The K2 sat on that, and the antenna ran off directly behind it at about a 45 degree angle, over the tree branch and down a few feet at the other side. The counterpoise ran off at right angles. I switched on the K2 which was still on 15m from my last mobile outing and immediately heard many strong signals. However signals didn't seem as loud or as plentiful as I would have expected during a major contest. I pressed the Tune button and the K2 ATU whirred away and finally delivered its verdict: 9.9:1! It couldn't match it! I didn't hear anything on 10m so that wasn't worth trying. I got a usable SWR on 17m but there was hardly any activity on that band. On 20m the best SWR was between 2:1 and 2.5:1, and on 40m I managed to get 1.5:1. Unfortunately the K2 is a bit SWR-sensitive - something I never noticed during the years I used it as my main home station when I could always get a 1.2:1 or better - and it flashed up Hi Cur (high current) when I tried to use 10W on 40m. So I had to back my power down to use that band, which didn't help matters. But these were not nice easy contacts like I made using the same radio and the same power from the car using the MP-1 antenna. My thanks, as well as my apologies to the stations that wasted valuable minutes trying to pull my call and serial number out of the ether. It was getting a bit cold and I felt a few spots of drizzle so I decided to call it a day. I think I'll stick to taking VHF on hikes in future. This isn't original, though I've edited it a bit. It was sent to me as one of those chain emails, so my apologies if you have already seen it. But I thought it was so true, I just had to share it. I think everyone should read it. To all who were born in the 1930s, '40s, '50s and 60s! We were born to mothers who smoked or drank while they carried us and lived in houses full of asbestos. They took aspirin, ate blue cheese, raw egg products, bacon and processed meat, tuna from a can, and didn't get tested for diabetes or cervical cancer. Our baby cots were covered with bright coloured lead-based paints. We had no childproof lids on medicine bottles, doors or cabinets. We rode in cars with no seat belts or air bags. We rode our bikes without helmets or shoes. The shops closed at 5pm and didn't open on Sundays, but we didn't starve! Our only take away food was fish and chips - no pizza shops, Burger King or McDonald's. We ate crisps with salt in them, white bread with real butter, drank full cream milk and soft drinks with sugar in them, but we weren't overweight because we were always outside playing! We rode bikes or walked to school and didn't get abducted. Our teachers would hit us with canes and gym shoes and bullies ruled the playground. It didn't harm us. When we wanted our friends we would just walk or ride round there and yell for them. No one was able to reach us all day. We would leave home in the morning and play all day, as long as we were back when the streetlights came on. We collected old drink bottles and cashed them in at the corner store to buy toffees, gobstoppers, bubblegum and bangers to blow up frogs with. We would spend hours building go-karts out of old prams and then ride down the hill, only to find out we had no brakes. We built tree houses and dens and played in river beds with matchbox cars. We were given air guns and catapults for our birthdays. We fell out of trees, got cut and dirty, broke bones and teeth and there were no lawsuits from these accidents. We did not have Playstations, Nintendo Wii, X-boxes, no video games at all, no 999 channels on satellite TV, no video/dvd movies, no mobile phones, no personal computers, no Internet, no Internet chat rooms. When we wanted to make friends we went outside and found them! We had freedom, failure, success and responsibility and we learned how to deal with it. And you are one of them. Congratulations for surviving despite so many difficulties! One of the things I have long wanted to do in this hobby is build a hand-held transceiver. I tried once back in the 1970s but the receiver didn't work and the project eventually ended up in the garbage. Many months ago while browsing Roger G3XBM's website I came across an old project of his called the Fredbox, a small, low-power hand-held 2m transceiver. This rekindled my desire to try to make my own VHF handy transceiver so I started the process of accumulating the parts that would be needed to make my own Fredbox. However there were two problems. Roger designed the Fredbox as an AM (amplitude modulation) transceiver, a mode that was probably still in common use back in the 1970s when he first made it. Here, the only chance of making a contact with such a radio is if it transmits on 145.500 in FM mode, so I would have to modify the transmitter to produce FM instead of AM. The other problem is that the Fredbox transmitter is crystal controlled. The days when suppliers advertised crystals for popular FM frequencies in RadCom at reasonable cost have gone, along with the crystal controlled transceivers that used them. I didn't know where to obtain the crystal I would need but hoped that someone might have crystals from an old 2m radio that they wanted to get rid of. My luck seemed to be in when, a couple of months ago, someone started selling batches of 2m crystals from old Japanese radios on eBay. I bid for and obtained three batches containing crystals for 145.450, 145.500 and 145.550MHz. I don't know what radios these crystals were originally for or what oscillator circuit they were used in but by using the XBM80 as a test oscillator it appeared that most of the transmit crystals oscillated at around 12.1MHz. I tried breadboarding the first oscillator stage of Roger's Fredbox circuit in order to experiment with ways of FM-ing the signal but the crystal did not seem to be oscillating. I did some searching for other 2m FM transmitter circuits in the hope of getting some inspiration and came across one using an MC2833P IC - a complete FM transmitter on a chip. This seemed like the ideal solution, especially as the crystal used to get 144MHz output was 12MHz just like the crystals I had. Unfortunately I couldn't find a supplier of this chip until on a whim I typed the part number into eBay. There was someone selling one chip! I ordered it and it arrived in the post this morning. I built up the circuit from the application note on my breadboard (as you can see in the photo) but to my dismay I could not detect any signal when using any of my 2m TX crystals. It was very disheartening. I didn't know if the chip was dead, whether I'd blown it by accidentally shorting together wires from components on the breadboard, or whether it was just a very fussy circuit. I experimented with different components and coils and got nowhere. I was just going for lunch when I had the idea to try one of my QRP CW frequency crystals. I had one for 10.106MHz and another for 14.060MHz. With both of those crystals I could detect not just a strong carrier on the fundamental frequency but also plenty of output in the 140MHz region. The chip is working, the problem is my eBay crystals! The question is, what to do now? I guess the crystals I bought, being probably 35 years old, have deteriorated with age and are reluctant to oscillate. It appears that the only way to proceed with the project is to get a brand new 12.125MHz crystal custom made, if possible. Due to having been banned from using the software I have not been keeping up with what is going on in the development of the ROS digital mode. However there have been a few interesting postings about it. In the digitalradio Yahoo group Skip KH6TY has posted the results of some tests conducted with ROS on 432MHz which appear to show that it suffers badly from the effect of doppler shift and flutter experienced at those frequencies, failing to decode over paths where Olivia was successful and even SSB was readable. This has prompted a rebuttal from the ROS author, which however seems to overlook the problem of doppler distortion encountered by Skip. He has posted a series of comparisons between ROS 2250/8 and Olivia 32/1000 which purport to show that ROS holds up while Olivia prints garbage. He concludes: "The difference between both systems is about 5dbs (3.16 in natural units). This means that ROS8 need 3.16 times less power than OLIVIA 32/1000 to establish a QSO to 150 characters/minute." Assuming that this is true, I nevertheless feel that a tradeoff of bandwidth for power or speed is inappropriate in the context of the narrow HF band allocations for digital modes. Most amateur QSOs do not need to go at 150 characters/minute (most people can't type that fast). On the other hand the 2250Hz wide ROS transmission blocks three channels that could be used for Olivia 32/1000, and even more channels that could be used for a narrower mode. The use of 2250Hz ROS effectively limits the number of people who can simultaneously hold a digital QSO. Even if it is true that Olivia needs 3 times the power than ROS to get through, Olivia is still a better choice of mode in the real world, because it is easier to increase the power 3 times or to switch to a slower mode than to find extra space within the HF allocations to accommodate the use of such a wide mode. ROS would be less of a problem if people used it only in circumstances where it would not be possible to communicate using a narrower mode. Unfortunately that discipline does not exist among today's radio amateurs. People are using ROS to make contacts with others whose signals are strong enough that 30Hz wide PSK31 could be used. This is just selfish, and it is the reason why I feel that such a wide digital mode should not be permitted on HF at all. Back in December I wrote that the RSGB had set up a Spectrum Defence Fund to enable radio amateurs to contribute towards the cost of a legal challenge to the UK spectrum management authority's failure to take action over the interference caused by power line networking devices. Pleased to see some positive action being taken I made a donation and also posted links on my blog and website to encourage others to do the same. Today I noticed, at the end of the RSGB Annual Report, the statement that "following advice from the Society's solicitors ... it was decided not to proceed at this time with any legal action." 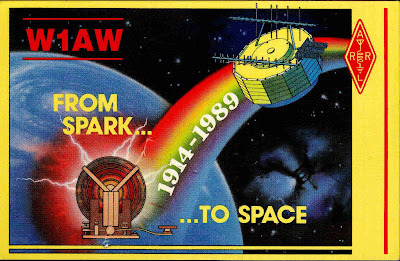 So the RSGB has given up the fight and I have removed the links to the Spectrum Defence Fund from my website so that no-one else wastes any money on it. Although PLT devices are a killer for any radio amateur unfortunate enough to live next door to one, it is clear from the noise at my own station and the comments I received from others with a similar problem that PLT is just the thick end of the wedge. A far greater number of short wave enthusiasts are having their enjoyment of HF ruined because of rising noise levels from a multiplicity of devices that individually would not be particularly intrusive. Whilst it is possible to track down and do something about a PLT installation, eliminating the noise that most of us in urban areas now experience from all directions would require the willingness of all neighbours to co-operate with finding the interference-generating devices and agreeing to replace them. This isn't likely to happen. I fear the battle to keep the short wave bands free of interference is over and ham radio is a lost cause. 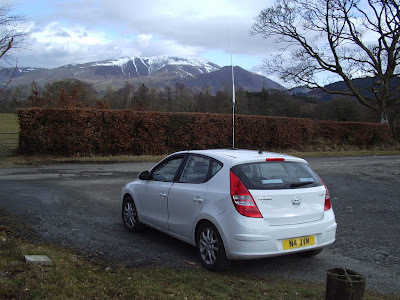 The only place to enjoy HF radio nowadays is out in the country, which unless you happen to live there means operating portable or mobile. The question is whether only being able to operate portable or mobile is enough to maintain most people's enthusiasm? Although I recently enjoyed operating from my car on a couple of fine afternoons, it is no substitute for being able to go into the shack on a wet day or a winter evening and have a tune around and make a few contacts. I find I am turning on my K3 less and less often these days and when I do I often turn it off again soon afterwards without making any QSOs. Will ham radio will still exist in ten years' time? Many former short wave and FM radio stations now broadcast over the internet rather than the airwaves and I suspect that an increasing number of ham radio operators will end up doing the same. They will get worn down by the losing battle against electrical noise and antenna restrictions and be forced to swallow their objections and switch to online "virtual ionospheres" like QSONet and HamSphere (shown above) where there is no QRN. You only need to visit the HamSphere site to see the number of amateur license holders that have taken this step already. The RSGB's apparent acceptance that it can't fight even a clear case of interference to short waves is clear evidence that this is a war we can't win. Final surrender is just a matter of time. It was a fine day, too fine to stay indoors, so I decided to go out for a couple of hours and do some more mobile operating with the K2 and MP-1 antenna. I didn't want to drive all the way to the coast as it takes a bit too long so I wanted to find a good site nearer home. I studied the map and found a likely spot not much more than three miles away near Tallentire Hill. There is a narrow lane that runs high up along the side of the hill with a good takeoff from north through west to south. At the high point there is a wide verge where you can park clear of the road. The only people who disturb you up there are a few dog walkers from Tallentire village, so it is ideal. Today 15m didn't seem quite as good as on Tuesday - or perhaps being beside the sea made a difference? Anyway after a while of tuning around on 15 I moved down to 17m and had a 5 minute chat with Sonny W8FHF in Ohio. Shortly after that I heard W1AW the ARRL headquarters station in Newington, Connecticut calling. It was being operated by Ron, K1RKD from nearby West Hartford. As an ARRL member I was particularly pleased to work HQ and Ron promised to log me on the computer so I would receive a QSL card via the bureau. I heard several other US stations and also Javier, XE2CQ very loud. I was sure he would hear me given the chance but he was having a long chat with someone and I didn't get an opportunity to call him. I made one more Stateside contact, with Roger N4ZC near Charlotte, North Carolina, though he struggled a bit to hear my 12W signal so it wasn't a long one. I went back to 15m after that, but the only other station I worked was Yussuf, CN8YZ, 59 both ways (he was running 25W.) Not great DX but still a nice contact. I am getting a bit hooked on this mobile lark as I seem to be hearing much better DX than I do from home and it is just so pleasant to hear atmospheric band noise and copy weak signals instead of the awful racket demonstrated on my recent video. In fact I must find out where I can obtain another power cable for my K3 as I would like to try my best radio in the car. It would be nice to have a bit more power, although I'm getting a real kick out of making SSB contacts with 12W to a mobile whip, but the main thing is the K3 receiver is much better. I received an email this morning (actually it was posted in my guest book of all places, though I have since deleted it) from a ham named Mike informing me that the program Morse Machine on my website contains a Trojan. It's a false alarm, and I've had it before. I blogged about it a few months ago, so I pointed Mike to that blog posting by way of an explanation. Mike didn't mention which scanner gave the false alarm but I was able to deduce from the copy of the scanner log he posted that it was ClamWin, a free GPL virus scanner. Now I'm a fan of free software and in fact experimented with ClamWin a few years ago, but the honest truth is it barely deserves to be called a virus scanner. A bunch of enthusiasts working in their spare time do not have the resources to develop a commercial quality virus scanner and I don't think anyone should be depending on such a program to detect viruses, especially as there are plenty of free (though not GPL) alternatives that are much better. "I downloaded your CW learning program for my grandson, trying to help steer him into Ham Radio. With the preponderance of malware out there, I find your opinions a bit disingenuous if not downright arrogant. i.e. the "Im ok and your not" attitude. You could would write your own installer like I (and others have) and stop the complaints (and your belly aching) rather than baiting users with KNOWN problems. That's my opinion, although I will concede you have the right to yours and say and do what you want :)"
My opinion is that I don't see why poorly written virus scanners should become my problem? Why should I rewrite the installers for all these programs, which doubtless will then be accused of containing a different Trojan? I don't make these programs available for money and no-one pays me for my time working on them. If making them available means I am obligated to spend more of my ham radio time supporting and updating them because of issues like this, the best thing from my point of view would be to remove the programs entirely. Nor do I see why I should have to put up with complaints like this just for making available programs I've written in the hope that others would find them useful. Of all the things I've done on this website, only the software results occasionally in emails that spoil my day and make me angry. I don't have time to delete the software section at the moment but I will when I get around to it. This afternoon I decided to tune around the HF bands to see how they compared with what I heard when I was out mobile yesterday and at the weekend. It was very depressing. I didn't hear any DX at all. The high noise level obliterated anything interesting and made listening very tiring and unpleasant. From the mobile out in the countryside the only man-made noise was the occasional burst of ignition interference from a passing car and I could copy signals right down to atmospheric noise. I thought I would use my Pentax digital camera to make a video that demonstrated just what the HF bands sound like from here. It's a ham radio horror movie. With rain being forecast for the rest of the week I thought I would take the opportunity to make a few more mobile contacts. Before I did I decided to make a modification to the antenna that I hoped might improve the SWR of the MP-1 on the magnetic mount. The Moonraker 7in. Turbo mag mount is not, in fact, a 7in. diameter magnet. It is more like a 5in. diameter magnet inside a steel case shaped like an upside down dinner plate with a 7in overall diameter. The magnet is not a tight fit inside the recess of the plate, so by drilling close to the flange I was able to make a hole without drilling into the magnet, to which I attached a terminal for one of those push-on electrical connectors. This could be used to attach a wire to ground the antenna to the car body. But as I hadn't found a suitable grounding point I decided instead to make up a set of quarter wave counterpoises for 10m, 15m and 20m which I attached to a mating connector. This time I thought I would drive to the coast to see whether being close to the sea would help me work across to North America. I parked beside the road half way between Maryport and Allonby, looking across the Solway estuary to the Scottish mountains in the distance. It was a sunny afternoon, the sky was blue and the sun glittered off the sea. A nice mobile QTH for a spot of operating. I set up the MP-1 on the magnetic mount and checked the SWR on 20m using the antenna analyzer: it was about 2:1 as it was before. I then connected the counterpoise, expecting the SWR to come down to a 1:1 and was amazed to find it made absolutely no difference. It was as if there was no connection to the counterpoise at all - though I checked, and there was. Possibly the SWR curve changed slightly but the null stayed exactly the same, which was very disappointing. I switched to 15m, tuned the MP-1 for best SWR and had a listen around. The first contact was with Nick, UY3LA from Lozovaya 150km south of Kharkov in Ukraine. My report from him was 55 to 59. He spoke good English and we had a chat for five minutes. I told Nick that my wife was in Kharkov at this very moment, and he invited us to visit him the next time we are both in Ukraine. I heard some nice DX including FM5WD, A71CV, XE1HH, VU2JQ and CU2AA. I also heard several Stateside stations but could not get through to any of them. I switched to 17m for a while and made a couple of European contacts with good reports, which surprised me as there was a small hill about 80ft high immediately behind me in the direction of Europe. I'll never understand HF propagation. I also had an eyeball QSO with a local from Allonby who drove by and saw my antenna. He was a fellow radio enthusiast and wanted to say hello. It turned out the radio he was enthusiastic about was the 11m kind, but he was interested in getting a ham license so I told him to contact the Workington club for more information. He has a better antenna than me - a Sirio vertical up at 20 feet above all the TV antennas. I can just imagine what my neighbours would do if I tried that. That's the trouble with living in a "posh" area. Eventually I returned to 15m where I could still hear several US stations. I called K1JDL who said "I can hear a mobile in there but I just can't pull you out" and then immediately QSY'd. Then I called Tom W0WP in Iowa who came right back with a report of 57 to 58. We had a really good chat for 15 minutes and Tom said that he "didn't miss a word." He was running 1200W to a TH6DXX so I said he must have a good receiver as my power was 20dB less than his. I thought he would say he was using a K3 but in fact he was using a TS-2000! However he is out in the country in a plot of several acres and the nearest neighbour is a quarter of a mile away so he doesn't suffer from man-made QRN. I can only dream! Mission accomplished: my first Stateside contact from the mobile and a good solid ragchew to boot. I decided to call it a day and go home for tea. It occurred to me recently that the reason why I can rarely bring myself to work anything other than digital modes is because the noise level on the HF bands at home is so high that listening to the radio is too unpleasant. Tune across the band and you hear dozens of carriers against a background of hash and buzz, with odd patches of warbly noises. Although the noise falls off on the higher bands the carriers if anything get worse. Forget about listening for beacons on VHF! I don't think the problem is solvable, as I believe I am hearing the combined output of all the houses in the neighbourhood, not the product of a single rogue device that could (theoretically) be tracked down and eliminated. So my instinct is just to work digital modes with the volume turned off. People have often asked me why I don't operate portable or mobile from the car to get away from all this QRN. My usual answer is that I often operate for an hour or so here and there and it isn't practical for such a short time as that. Operating from the car on a cold dark winter night isn't as attractive a prospect as doing it from a warm shack, and my wife would probably take a dim view my going off for three or four hours at a time just to talk on the radio in any case. But Olga is away at the moment and I'm getting fed up with digital modes, so I thought I would give it a go. I already had a Superantennas MP-1 which I bought for portable use, but haven't made much use of it for that due to the British weather rarely being warm enough to tempt me out. (Yes, I know SOTA types operate from hilltops in sub-zero temperatures and howling gales, but I like my comforts and they're masochists.) A quick trip to Maplin in Carlisle resulted in the purchase of a Moonraker 7 inch Turbo mag mount with the requisite 3/8 fitting. Then I drove out to a quiet spot to try it out. The spot I chose isn't an ideal radio location as it is surrounded by hills, but I haven't yet found somewhere with a good take-off that isn't a "viewpoint" and packed with tourists, or anywhere that I can drive on to the beach. I took the antenna analyzer along which made tuning the antenna a lot easier. I started off on 15m, where I got an SWR of 1.5:1. For the radio I took along my Elecraft K2, which has been little-used since the K3 came along. I set the power to 12W and searched for someone to work. My first mobile contact was with John 9H5JW, a British expat living in Malta. He gave me a 58 report to my 59 (he was running 100W). We had a good chat for ten minutes and I felt the MP-1 was doing a really good job. Next I heard KD4FNI from Ozark, Alabama. He didn't hear me, unfortunately. My next contact was with Nick RV3EFR near Orel for 59 both ways. Then I tried to call Harry 7Q7HB in Malawi. He was working another mobile in Finland, but unfortunately when he finished there was a bit of a pile-up and he didn't hear my call. He was strong enough that I'm sure we could have made a contact, as was KP4BD in Puerto Rico whom I also called without success. My third contact was VU2DSI from near Mumbai in India. He gave me a 56 to his 59. I'm pretty sure I haven't worked India before, even from home, so I was very happy with this. The /M suffix is really worth about 10dB of gain. "Will the mobile please call again." My final contact on 15m was with Mauro I5HOR near Florence. He gave me a 55. I was pretty happy with those contacts, but I wanted to see how the MP-1 performed on a mag mount on the other bands. On 10m I got a 1.2:1 SWR, though there was nothing to be heard on that band. I went up to 40m and the SWR dip was pretty sharp and would only come down to 3:1. On 20m I got around 2:1, and managed a quick QSO with Franco IZ4NPE for a 58 report on that band, so it was not too bad. Clearly the poor ground through the mag mount affects the SWR of the MP-1 on the lower bands. The K2 ATU can take care of this quite happily, but possibly performance is compromised as well. A permanent mount on the car isn't an option, nor would it be worth the trouble for the amount of use it is likely to get. I will have to see if I can drill the mag mount and fit a terminal that would allow me to attach a temporary ground wire to the car body, or even a resonant counterpoise, if that would make a difference. All in all it was a worthwhile exercise that I'll probably try again. To make a contact with India from a parked car using 12W to a whip antenna is quite an achievement! I still haven't made a contact with the little Nano-40 QRPP transceiver I made, but after listening on several occasions I finally heard its signal coming back from the Web SDR at the University of Twente in the Netherlands at 2100 this evening. I sent a few V's and clearly heard them come back with a second or so delay from the remote receiver. I then attempted to send CQ, but the distraction of the delayed signal made it difficult. The signal was lost in the noise some of the time, but at other times it was perfectly clear and readable. I calculated the distance between my QTH at locator IO84hp and the Web SDR at JO32kf to be about 750km or about 450 miles. Not bad for 150mW to an MFJ magnetic loop antenna in the attic! Isn't QRP amazing? I will treasure the first contact I make with this little radio, so for the time being I am not going to cheat and try to arrange a sked because it would be much more of an achievement to make a contact that happened naturally. But if you should hear me one evening calling CQ close to 7.030 please reply slowly because I can probably hear 4 or 5 different stations at the same time and my CW is not that hot so it will take a lot of concentration for me to read you. A bit more power might help too because the little guy's receiver isn't as sensitive as the one you'll be using. I didn't plan to produce a schematic of the Nano-40, the tiny 40m CW transceiver I built based on Roger G3XBM's 80m XBM80-2 design as modified by Alan VK2ZAY as I don't claim any originality for the circuit. I provided the original sources and discussed the changes I made to the circuit and thought that other builders would follow the same path. However I have been asked by a couple of people already if I could provide a schematic so I have patched a copy of the circuit diagram produced by Alan to show what I ended up with. 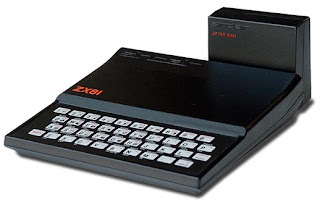 I hope that will keep everyone happy, but please remember that without Roger G3XBM's genius and Alan VK2ZAY's improvements the Nano-40 would never have happened. A few weeks ago fellow blogger Dominic M1KTA wrote that he was selling off some unwanted projects from his shack, including some unbuilt or part-completed kits. A little while ago he wrote: "I have decided to stop selling off project builds now and I am keeping hold of everything until a rally when I can sell them in person as I have had a complete nightmare after selling one of the projects over the internet to someone I believed was capable of finishing it and has demanded I rebuild and re-align it after they hacked about with it themselves to the point where it no longer functions, they melted the pcb connectors and filed away part of the pcb and at least one track in the process to attempt to squeeze it into a box that was too small and demanded a paypal refund. I am never again selling a 'built' project over the internet it is too risky for me." I have bought things before, either at rallies (hamfests) or from ads in RadCom, that were found not to work and sometimes revealed some astonishingly ham-fisted handiwork inside. The purpose of some modifications defied understanding. I either fixed them myself or wrote it off to experience. The idea that someone could buy an unfinished kit and then try to make the seller liable for their inability to complete it just beggars belief. It seems some members of this hobby have no shame and no pride. I told Dom he should publish the callsign of this so-called amateur as a warning to other sellers to steer clear. I know I would. Today I finally completed the little 40m CW transceiver based on Roger G3XBM's 80m XBM80-2 design as modified by Alan VK2ZAY and further modified by me to work on 40m. I tried to think of a name for it that would acknowledge both these sources of inspiration, but I couldn't come up with anything snappy, so in the end I named it the Nano-40 because it is very small and works on 40 metres. 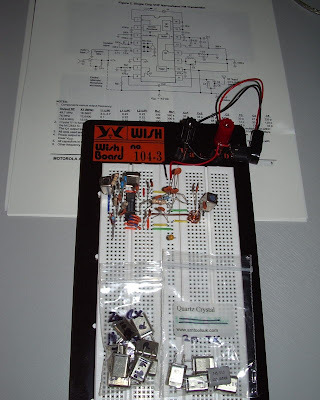 The circuit is essentially the same as the one given by Alan VK2ZAY with a few component changes determined empirically while the rig was on the breadboard to allow for the fact that it is working on 40m instead of 80m. There is only one stage of low pass filtering instead of two, as I described in an earlier post. This seems to be quite adequate. 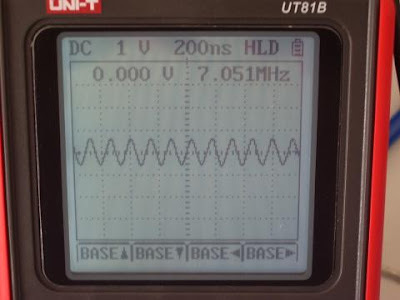 I checked the output waveform using my new oscilloscope and it looks nicely sinusoidal. I also used an MPSA13 Darlington transistor instead of a 2N3904 in the audio stage for a bit more sensitivity and gain. With the component values I chose the little rig gives 150mW output on a 12V supply or about 75mW using a 9V PP3-style rechargeable battery. There is no sidetone, but it has full QSK. Using my Elecraft XG1 test oscillator I found that a 1uV signal is just about audible. However, bearing in mind that you can receive all activity around 7.030MHz plus and minus the limits of your hearing, a workable signal would need to be a bit stronger to stand out from the crowd! 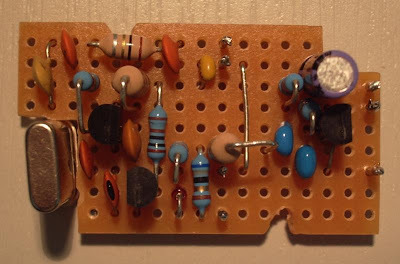 The circuit was built on to a small piece of Veroboard and the result is shown above. 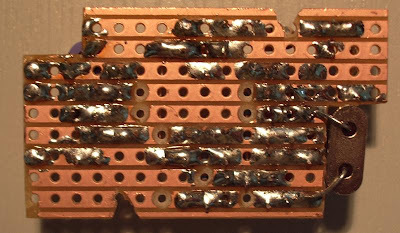 In case anyone wants to try to replicate it, the reverse side of the Veroboard showing the breaks in the copper is shown below. The rig was built into a small translucent blue project box. The box I ordered for the project turned out to be just a bit too small for comfort. It was not quite high enough for the crystal, so I had to cut away part of the circuit board so the crystal could be mounted with its base below the board itself. The space was also a bit too tight for the connectors. Consequently final assembly took much longer than it would have done using a larger enclosure. A fair bit of "fine tuning" with a file was needed to adjust clearances which were down to the last millimetre. With the lid on there is not enough room for the spring loaded contacts of the two 3.5mm jack sockets to fully open so the key and earpiece plugs are a tight fit. There was not enough space for a power socket to be fitted internally so after a lot of thought that was eventually resolved by super-glueing a PCB-mounted power socket to the side of the case. Although I had tested the circuit prior to assembling it into the case there was a heart sinking moment when I applied power and heard no signals at all. Close inspection showed that I had a solder bridge across the antenna socket. This was quickly removed and then the transceiver was found to perform as well as it always did. I have put out a number of CQs with the little rig but have yet to make a contact with it. Because I don't live in a densely populated area I don't have any nearby hams to make a sked with to prove that it really works. 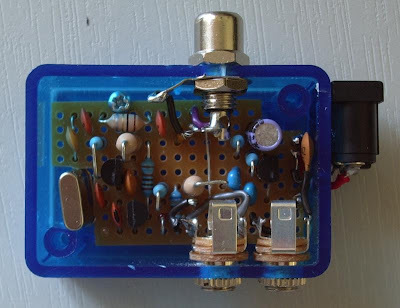 You don't build a rig like this to make a lot of contacts, of course, you do it to prove that it is possible to make a fully functional transceiver this simple and this small. 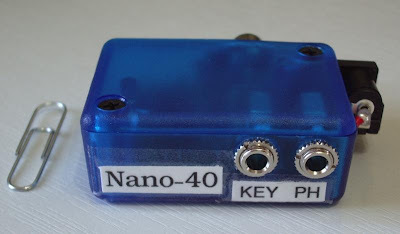 Nevertheless I do hope to make a QSO with my little Nano-40 one day. There was a knock on the door this morning and the postman asked me to sign for a parcel from overseas. The customs declaration amusingly - if appropriately - described the item as "Toy". 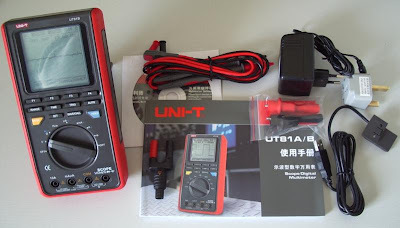 It was the UNI-T UT-81B Oscilloscope Digital Multimeter that I ordered last weekend from eBay seller hk360radio in Hong Kong. My first thought on opening the box was: "Wow! All this for a hundred quid? Amazing!" 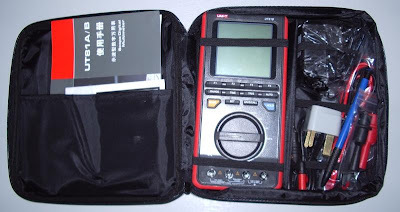 Inside the zip-up fabric carry case was the scope/multimeter, test probes, a BNC oscilloscope probe adapter, an opto-isolated USB cable for connecting the instrument to a PC, a two-pin wall-wart power supply and a two-pin to UK three-pin mains adapter, manual and CD containing the PC software. The instrument is both a multimeter and a storage oscilloscope. The multimeter is auto-ranging, so the control switch simply selects the function: voltage, current, resistance etc. It measures DC voltages to 1000V, AC to 750V, current to 10A, resistance to 10M, capacitance to 100u and frequency to 10MHz. There is also a continuity tester. It can read volts down to 100uV and current down to 0.1uA. The frequency counter accuracy isn't good enough to calibrate your radio, but it's still quite handy. Many years ago, back before I had a ham radio license, I had an oscilloscope that I built from a design in Radio Constructor magazine. It only covered up to about 200kHz and wasn't calibrated. I had to sell it when I left my parents home and had nowhere to keep so much electronic stuff, and I haven't had one since. But there have often been occasions when I wished I had one, so that was one of the main reasons for buying the UT-81B. The oscilloscope bandwidth of the UT-81B model is quoted as 8MHz, so I can't use it as a monitor scope for the whole of HF, but it covers up to 40m at least. I was very keen to try this. I connected my FT-817 up to my QRP power meter via a T-piece and connected a cable between that and the oscilloscope. When I spoke into the microphone I could see the modulation envelope on the display. I was interested to see whether the horizontal scan rate was fast enough that I could see the actual RF waveform. I increased the timebase speed until I was able to see the display above of the carrier wave from the FT-817 in CW mode. The sample rate is given as 40MHz and you can just see that the waveform is a little jagged. You can see that the scope has also displayed the frequency to within 1kHz. There is a full range of trigger functions and also a manual hold you can press to capture the display, which I used to take the photo above. There is a Windows software application that connects to the instrument via a USB port. It can log measurements over time and also capture scope displays and save them to a bitmap (BMP) file. I was able to capture the waveform shown in the photo. However it was not able to capture an RF modulation envelope when sampling the RF at a much slower time base setting. I just got a thin wiggly line that seemed to bear no relation to the envelope displayed on the scope itself. Not a major issue, though. A few weeks ago I made a rubber duck helical antenna for my TH-F7E. I didn't get around to writing about it at the time, plus it took a while to get some reports of its performance. Well, it works extremely well, and I have just added a description of how to make it to the main G4ILO's Shack website. See A DIY Ducky for 2m. I'd sworn I wasn't going to post any more about the ROS digital mode, or even mention it by name again, but the latest bizarre twist in the tale is too much to resist. Here's the story. On March 3, Dave AA6YQ called the FCC to confirm whether the statement that ROS was now legal for use in the US which had been posted on the ROS website and which I wrote about on Tuesday was true. The FCC advised that the information (which has since been removed) was not true, and that the matter was still under review. Dave was told that the ARRL was involved and would publicize the outcome. This they have now done, and the outcome is that ROS remains illegal for use in the USA on frequencies below 222MHz. ROS may still be legal in the rest of the world but I have to ask whether amateurs in Europe and elsewhere really want to be using a mode developed by someone who posts false information and rude remarks on his website and issues threats to any amateurs (including myself) who dare to make any statement against his mode. This is not mature, responsible conduct nor is it in the spirit of amateur radio. We don't need this sort of behaviour which has come close to bringing the hobby into disrepute. It might be for the best if everyone stopped using ROS altogether. It isn't as if there aren't already plenty of other digital modes. And be honest, a mode that offers no chance of working any North American DX is not as interesting as one that can, is it? As someone who has quite often used WSPR, I have often said that it would be nice to be able to exchange reports with other stations and confirm the "contact". I felt this simply because the WSPR network is a friendly community and it feels right somehow to be able to do that, just as you would confirm an enjoyable contact on another mode. Modes like the little used WSPR QSO mode and JT65A on HF offer the chance to make two way QSOs using similar power levels to WSPR. But my recent experience using JT65A on HF, and more recently watching a station in Iceland take half an hour to try to exchange a signal report and confirmation with a station in Brazil using a certain other weak signal mode led me to wonder if in trying to make it possible to make "contacts" using the least possible power we have thrown the baby out with the bath water. 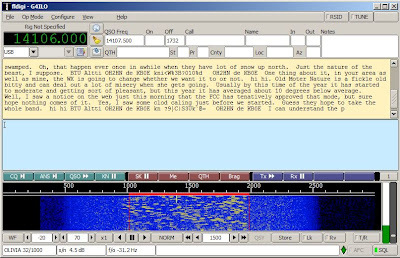 Communicating via moonbounce (EME) on VHF has always been about exchanging the barest minimum of information, because even doing that is a major achievement. But on HF it is always possible to have a proper contact, even if it means using a bit more power or waiting until propagation is a bit better. So why are we endeavouring to use modes designed for EME on the HF bands? What is actually being achieved? Someone's computer is able to pick a few characters of information out of my barely audible signal, with the help of heavy error correction and the fact that the message format is known. My computer is able to do the same with his. Is this actually a contact? Yesterday I tried for the first time in several years to use the Olivia digital mode. Before I did, I Googled up some information about it, and came across a Yahoo group containing a post by Waldis, VK1WJ. He wrote: "Yesterday I had a sked with DJ2UK on 20m in JT65A. Bert came in with around -17dB but he couldn't decode my signal. After a while I saw in SPECJT that he had switched to Olivia 8/125. So I did the same, and we had quite a long error-free QSO. Olivia 8/125 is not exactly fast, but it still beats JT65A hands down. May be we could entice our JT65A friends to try Olivia instead?" According to Waldis, instead of exchanging a couple of numbers using JT65A, you could have an actual (if slow) conversation using the 8/125 variant of Olivia. But the JT modes are currently in vogue, whereas Olivia - being developed in 2003 - is yesterday's news. People are raving about the capabilities of a certain other mode that is making a lot of news recently. Have all these people actually tried some of the forgotten modes? Because I think if they did they might wonder what all the fuss was about and whether the newcomer really justifies its use of bandwidth. What was I saying about reinventing the wheel? Today I spent a couple of hours making some contacts using the Olivia digital mode. It isn't the first time I have used the mode. I used it several years ago back when I used the MixW software. I seem to remember that it produced good copy even when using 5W from my K2, but it was hard to find other people to QSO with. But now there seems to be plenty of activity. Olivia even has its own website. Although using Olivia is much the same as using PSK31, using the same software, it has quite a different feel. As with PSK there are different versions of Olivia. I was using Olivia 32/1000 which on 20m is normally found around 14.106MHz. This mode is 1kHz wide and operators use USB with the suppressed carrier frequency on an exact 1kHz multiple, e.g. 14.105, 14.106 or 14.107. The center frequency of the waterfall is set on 1500Hz, so the audio tones are generated between 1 and 2kHz, which is in the center of the passband with most radios. If you do this and your rig is accurately calibrated you should hear anyone who calls on that frequency without any need for re-tuning. Olivia 32/1000 prints out slower than PSK31 which makes for nice relaxed contacts. People tend to chat using the keyboard instead of exchanging macros, though they may use a macro for the basics. Olivia uses forward error correction, so you may not see any print for several seconds after a transmission started and it may not finish printing until after the transmission stops. But the copy is usually 100% perfect even when the signal dips into the noise so you can barely see it in the waterfall. I swear I'm not biased but I thought Olivia performed much better than another mode that is no longer mentioned by name in G4ILO's shack and is more than twice as wide. My first contact was with Andri VE2AHS in Ottawa which was 100% perfect copy throughout. I don't believe I would have made this contact using PSK31 at the same power level (25W into my attic dipole) nor do I believe I would have had such good copy using the other mode. Next I had a 40 minute chat with John, W9CY near Peoria in Illinois. Again, it is just unimaginable to have such a long ragchew with the USA using any other digital mode. John had heard interference from a strange new mode recently and asked me if I knew what it was so the K3 PA got another warm-up as I filled him in on the details. In fact, some fairly strong QRM from the unmentionable mode did appear during one of his overs but although I did lose a few words Olivia survived the interference pretty well, and better than the new mode survived Olivia. Finally I was called by Adriano, IZ1PSS, who informed me I was his first contact on the Olivia mode. He had a good strong signal so I left him the frequency as I had been on the air for quite a while by that time. I really enjoyed my session using Olivia - so much so that I intend to spend a lot more time in future using the mode. The ability to hold long rag-chew keyboard QSOs with near-perfect copy over long distances using relatively low power and an indoor antenna isn't something that I thought I could do. We hams seem rather good at trying to reinvent the wheel when we already have several perfectly good ones that we hardly ever use. 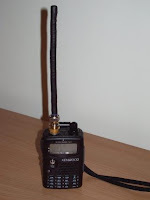 I understand that the trend in amateur radio these days is towards self regulation. However, recent events in the digital sub-bands lead me to believe that this is just a recipe for chaos. I refer to the recent appearance of ROS, a 2.2kHz wide digital mode apparently developed for weak signal work. Soon after the ROS software was made generally available, chaos ensued with ROS users causing interference to IBP beacons, established APRS and ALE networks and Olivia users, not to mention other ROS users. Any chances of making DX low-power contacts were dashed by the number of people trying to use a limited number of frequencies to make short range QSOs that could have been accomplished using PSK31 and one twentieth of the bandwidth. The band plans do not set aside specific sections of the digital sub-band for different modes. I am told that this is so as not to hinder experimentation. However, many popular modes such as PSK31, WSPR, Olivia etc. have established their presence on various parts of the bands and this is normally honoured by "gentleman's agreement." This all goes out the window when someone posts on the net that a new mode is available and hundreds of people download software and go mad with their new "toy" without any authoritative guidance as to where to operate. The experience with ROS throws into question whether different digital modes can co-exist in the same band space. Many digital users seem to treat signals in another mode as QRM to be transmitted over rather than somebody else's contact. The problem in the case of ROS is exacerbated by the fact that the transmission of this mode is 2.2kHz wide, which makes it harder to avoid causing interference to somebody. I think we should also be asking if there ought to be a limit on the width of digital modes that can be used on the HF bands, because there just isn't enough space in the digital sub band for many people to each have a clear 2.2kHz wide channel. I am not against experimentation, and would suggest that a small part of each band be set aside for experimental modes, experiments being conducted by the developer and a few chosen testers. However, before a mode can be made available for general use it should be approved by an international committee which would take into consideration the benefits of the mode, the amount of bandwidth it occupies and what frequencies it may be used on. Has a period of 24 hours to correct the news about the legality of ROS in your blog or it will be illegal to use it yourself. Am I making myself clear enough. Several hours ago I posted about the news that the FCC had reversed its decision regarding the legality of the use of ROS in the US. Is that not good enough for him? A week ago, when I posted that ROS was illegal in the US, that was what the FCC believed and what I wrote was true at the time. I am not in the Soviet Union and I am not rewriting history to suit someone else's convenience. Moreover, if someone has an issue with me or anything I write, would not the correct way to proceed be to send me an email, not issue an ultimatum in a public forum that I may or may not read? I am so angry I can barely type. Sorry, i did not see the new post. I apologize and I hope you put yourself in my place and understand my indignation. I don't wish to have any ill-feeling so I have accepted his apology. But I am still pretty angry and upset about the manner in which he chose to express his indignation. Even if I hadn't yet written about the changed ruling, an email would have been all that was needed to obtain my assurance that I would as soon as I could. I will not be using the ROS digital mode any more. José Alberto Nieto Ros, the developer of the new ROS digital mode, has submitted the technical specification of the mode to the FCC, as a result of which they conclude that ROS can not be viewed as Spread Spectrum and would be encompassed within the section 97.309 (RTTY and data emissions codes). Now, all that needs to be resolved is the issue of where to use it without causing complaints from users of existing nets and other modes. Anyone with experience of getting quarts into pint pots please apply now. I have been browsing for information about various circuits recently. 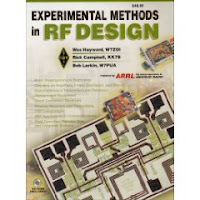 Two books that are often recommended are "Solid State Design for the Radio Amateur" (which is now quite old) and its successor "Experimental Methods in RF Design". I decided to get a copy of the latter and was gobsmacked to find on Amazon.co.uk that only used copies are available, priced from £557.14. No, that's not a misprint, it's about 800 bucks in real money. I browsed down the Amazon.com page to see the usual stuff Amazon tells you about a book and found that 37% of people (rich or insane people, presumably) buy the item featured on the page, while 36% buy "Experimental Mathods (sic - not a joke) in RF Design" for a mere $42.70. That's 36% who can't spell, I guess, but I can live with a misprint in the title if it saves me $550. But seriously, what's going on here? Is "Experimental Mathods" a pirate copy using a mis-spelt title to avoid copyright infringement? Is a joke being played on somebody? If I buy it will I receive something other than what I expected, like searching for "mammaries" instead of "memories" on Google? I'm off to confused.com.